In late 2017, in the wake of the collapse of Air Berlin, Lufthansa took the operational decision to deploy widebody aircraft on domestic routes to and from Berlin in order to satisfy high public demand for seats. Flights between Munich and Berlin were operated with the Airbus A330 and A340-600, while a number of flights between Frankfurt and Berlin were scheduled with the Boeing 747-400. The opportunity to take a flight aboard the Queen of the Skies on such an unusual short-haul route was too good to pass up, so I booked a ticket as soon as I learned about it. I originally booked a return Economy Classic (L) fare for €168/£148. This fare entitles the ticket holder to one piece of hold baggage up to 23kg/50lbs in weight and free seat selection from the time of booking. On this occasion, I upgraded my ticket at the airport for a supplement of €79/£69. While I wouldn't ordinarily spring for Business Class on such a short flight, this offer was far too good to pass up, so I happily handed over my money and, to my delight, even managed to secure a window seat. It was still dark when I arrived at Frankfurt Airport's Terminal 1 at around 06:40. As is my custom when taking early morning flights from FRA, I had spent the night at the 'Comfort Hotel Frankfurt Airport West' and taken advantage of the shuttle bus to get to the airport. The check-in hall was still relatively quiet at this hour, so I was able to check in quickly using one of the many self-service machines available, after which a Lufthansa agent guided me through the self-service bag-drop process. With my flight scheduled to depart from Gate A15, I made my way towards departures, pausing briefly in the 'Lufthansa Worldshop' in order to make a couple of quick purchases. It was then just a matter of a short ride on the airport People Mover to Concourse A, followed by a very quick security check. I found myself airside less than half an hour after entering the airport. Above: I found Gate A15 very quickly, but upon my arrival there was no aircraft to be seen. Within ten minutes, however, the reason for my trip to Berlin arrived in the form of D-ABVS. The mighty 747 immediately caught the attention of bemused passengers - most of whom were taking photographs and some of whom were heard to remark "that can't be our plane". Thereafter, a series of further 15-minute delays were announced, with boarding expected to begin at 08:50 (five minutes after our scheduled departure time) and eventually beginning shortly after 09:00. Regardless, I was excited to fly aboard the Queen of the Skies for the first time and happy that the flight had only been delayed and not outright cancelled. When boarding did commence, I was among the first to make my way down the forward jetbridge and received a friendly welcome from the two Flight Attendants standing at Door 1L. 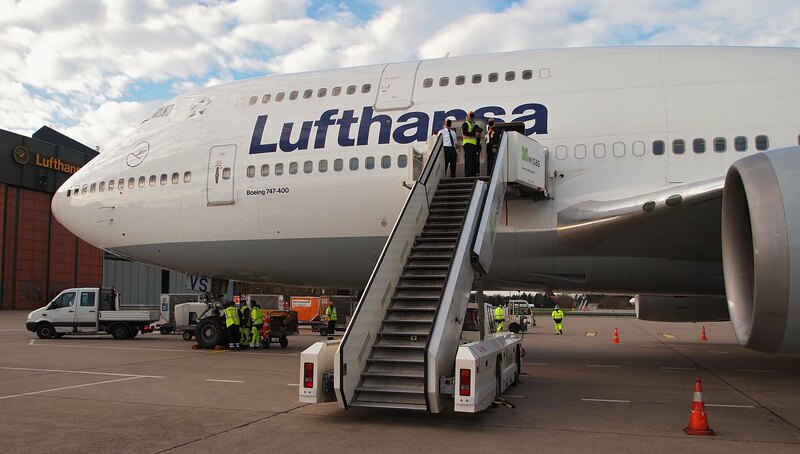 Lufthansa uses two jetbridges for 747 boarding at Frankfurt, with one being reserved for Business Class and the other for Economy. Above: The view from Seat 12K towards two Lufthansa Airbus A321s and a Scandinavian Airlines A320. My first impressions of the cabin were positive. The seat was very comfortable, the IFE Screen large and the legroom (naturally) excellent. The only downside to the current Lufthansa long-haul Business Class cabin is that it is arranged in a 2-3-2 configuration, while most other carriers have transitioned to an all-aisle-access 1-2-1 layout. There was no Pre-Departure-Beverage or Newspaper service prior to departure, although a range of Magazine and Newspapers was available on a rack in the forward cabin. Once the boarding doors were closed, the Captain made a welcome announcement and explained that D-ABVS had not originally been scheduled to operate this flight. He further explained that an air conditioning fault with the original aircraft meant that D-ABVS had to be substituted therefor, which in turn had led to an unavoidable delay. He concluded by announcing a flying time of approximately 50 minutes to Berlin and expressing his hope that we would all enjoy this special flight aboard the 747. Above: We took to the air from Runway 25R. D-ABVS romped down the runway with what appeared to be very little effort at all. Naturally, I spent most of the climbout gazing out of the window and taking photographs. Above: The cabin in flight, shortly before the breakfast service began. 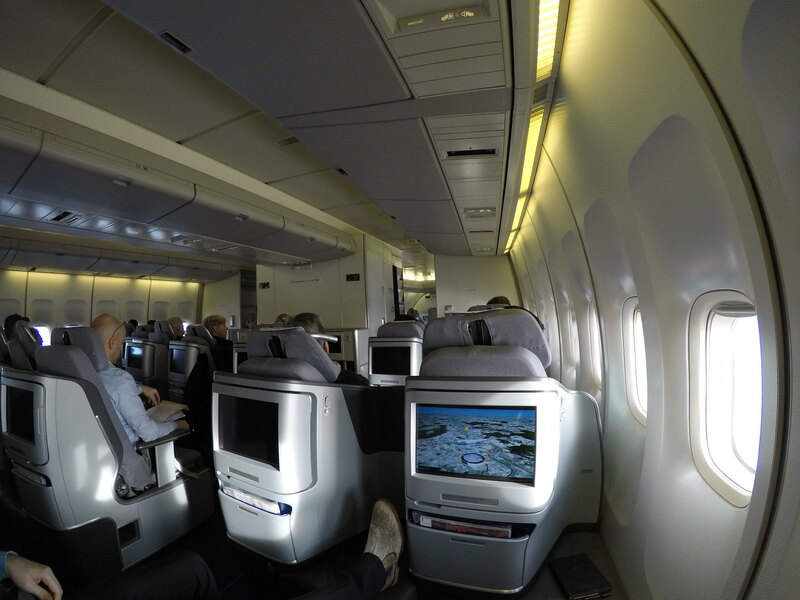 These photographs highlight the general layout, legroom and large IFE screen. There was insufficient time to fully probe the In-Flight-Entertainment system, but on this short flight the moving map became my favourite feature. I also enjoyed listening to the extensive collection of German Schlager music available. Unsurprisingly, the Service began swiftly with the distribution of cold towels, followed by food and beverages. I was impressed with the quality and quantity of food provided on this flight. The Chocolate Muesli was very good, while the bowl of sliced meats and cheeses were a tasty addition to the meal. A range of hot and cold drinks were offered; including tea, coffee and fresh juices. I chose to enjoy a cup of coffee, which was served in a ceramic mug. The meal service is representative of a typical Lufthansa short-haul breakfast and was in no way embellished on account of the Boeing 747 operation, meaning that this high level of service is to be expected on all domestic flights. Shortly after I had finished eating, the Flight Attendants passed through the cabin to clear away the trays, around which time we also began our descent towards Berlin Tegel. In spite of the short flight time, the service was friendly and attentive and did not feel at all "rushed". I really could not have expected, nor asked, for anything more on such a flight as this. 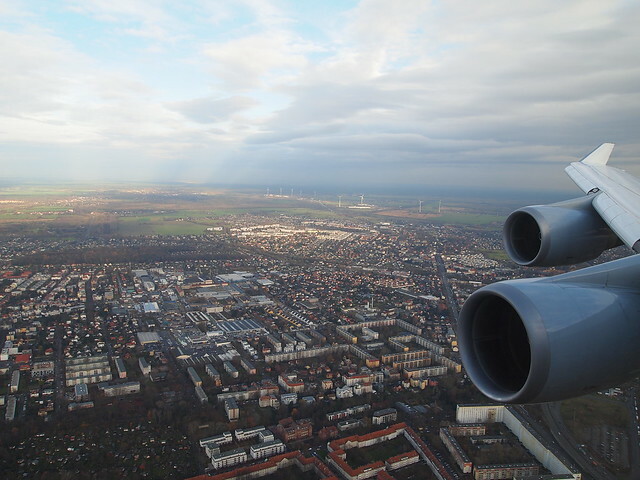 Above: Final approach to Berlin Tegel (TXL) over Berlin's Spandau neighbourhood - the end of a wonderful and unusual flight. 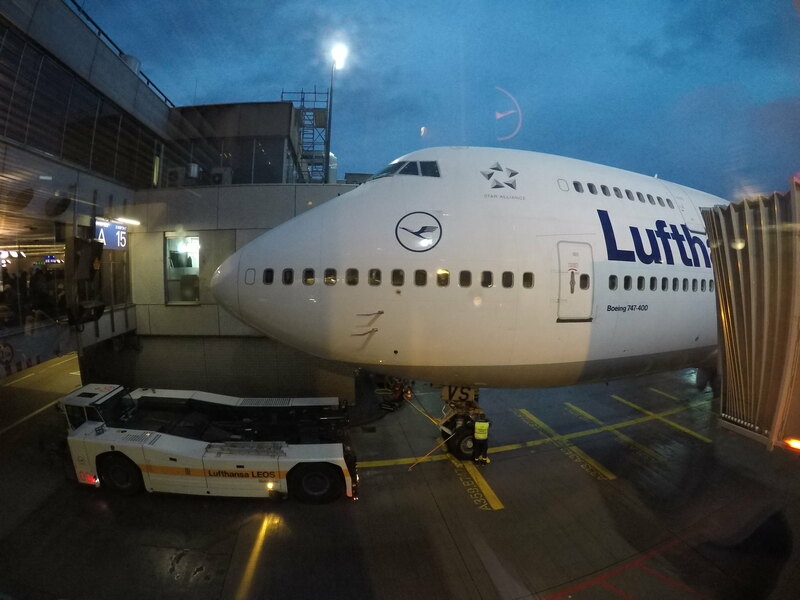 The Boeing 747 is too big for the gates at Tegel Airport, which meant that, following a firm landing, we pulled into a remote stand. After the doors were opened, I waited for other passengers to disembark and then, with the permission of the crew, set about taking some photographs of the empty Business Class Cabin. Since we had parked at a remote stand, passengers were presented with the rare opportunity to disembark a Boeing 747 directly onto the tarmac. D-ABVS was attracting a significant amount of attention from passengers as they disembarked - I was certainly not the only one with a camera of some description pointed at the aircraft. Above: D-ABVS, viewed from the tarmac. The service during my flight was excellent, and it was particularly noteworthy that the crew onboard pulled out all of the stops to make the experience a memorable one by taking photographs (not pictured in this report) of me in the cabin and on the tarmac in front of one of the engines. The experience of flying aboard a Boeing 747 on such a short flight was worth every penny I paid for my ticket and upgrade. It is a magnificent aircraft, a great ride and it still turns heads wherever it goes. This flight was a memorable, unusual, unique experience and one I shall remember for a very long time to come. Thanks for the FANTASTIC trip report!! Very well written! 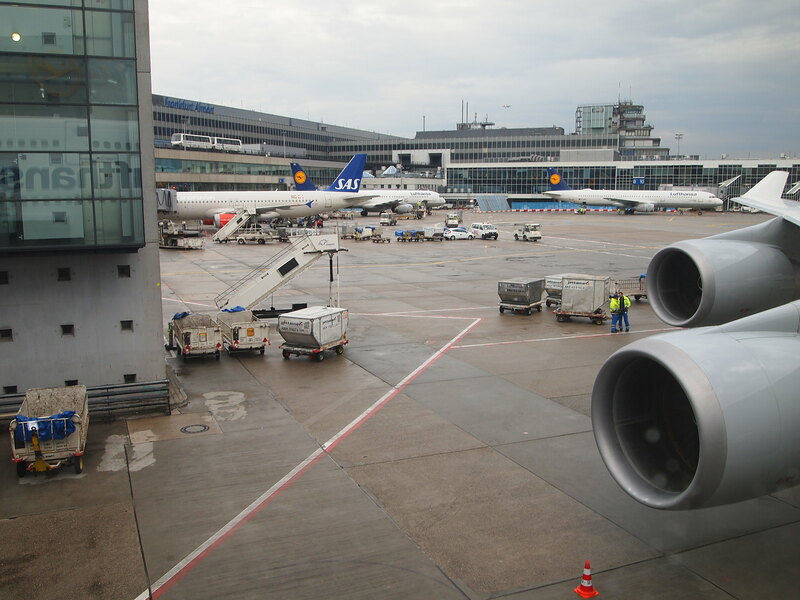 * We had an early morning departure from FRA, but we stayed at the Hilton Garden Inn at the airport. In my adult years of flying, I have only been outside to touch a mainline airliner once, in August of 2001 from San Diego gate 1A. Everyone walked to the front stairs, but I walked to the back, under the wing. I remember thinking, "I could just reach out and touch it! "...but I didn't. And you had the same thing, only with a 747-400. SO cool!! That was a unique experience. Thanks for sharing it. Were the prices any cheaper or was it normal business class ticket prices? Great report, thx for shearing. With such high prices for short domestic flights, no wonder Ryanair and flexibus are doing so well in Germany. Your external link doesn't work. Prices can be much higher than that on domestic routes! I actually find it to be okay. Deutsche Bahn asks you to hand over 132 euros for that route in coach (flexible price: no need to stick to a certain train, without reservation). Travel time is roughly four hours. great report & photos. My partner & I were in FRA in Oct 2017 & she was in 747 heaven as that is her absolute favourite plane. In 2018, I experienced a similar scenario to yours. In August of 2018 we were camping in Western Australia and during that time, Qantas was using the 747 on selected domestic flights between SYD & PER. My partner had never travelled on a 747 before and I knew it was on her bucket list, so I secretly booked us on a PER-SYD return flight. I didn't reveal anything until about 50 minutes before departure when we were at the airport plane spotting. She was absolutely bewildered and didn't know what to make of the boarding pass! We had a fantastic 3 hour flight from PER to SYD travelling at 724 mph at one stage and another fantastic 5 hour flight SYD to PER the next day! 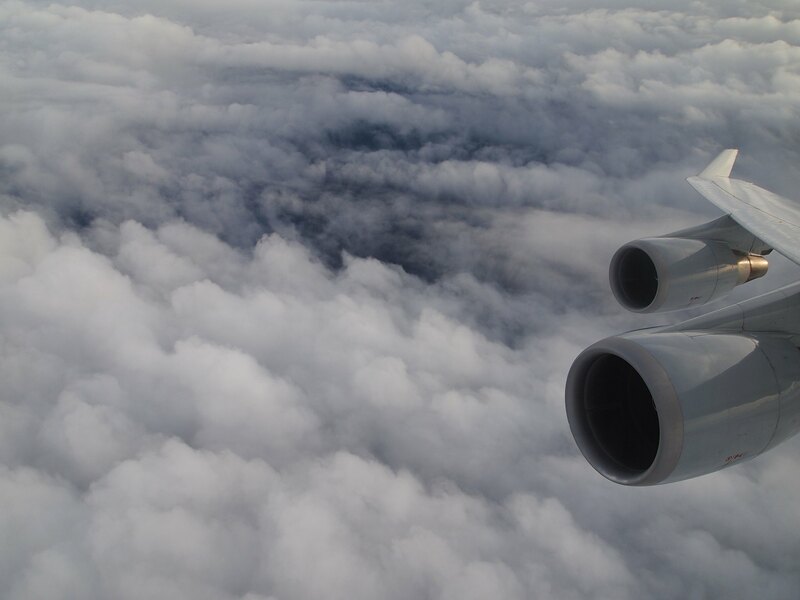 Window seats in both directions and the crew were great, making sure that my partner had 2 unforgettable 747 flights. Aircraft was VH-OEB, unfortunately soon to be retired in April 2019.